Although during these dates the celebration of Halloween is well known, in Barcelona and in part of Spain, we have our own tradition to celebrate the millenary festivity of All Saints’ Day: the Castanyada. Within our local tourism, you cannot miss the opportunity of celebrating such emblematic festivity, which, as well as popular culture and history, includes a very important element: gastronomy. 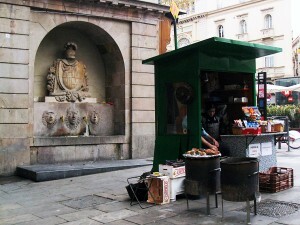 ‘Castanyera’ stand in front of the Pla de la Boqueria fountain, at Rambla de Barcelona. Photography by Enric ‘Enfo’. In addition to the Castanyera stands which we can find in some streets, and where we can buy chestnuts (in Catalan castanyes) wrapped with a newspaper sheet, recently taken from the fire and still steaming, we can also find, in most of the store windows, the so called panellets (a very little cake with different tastes made of sugar, egg, hazelnut and potato or sweet potato). Both treats can be accompanied by candied fruit, roasted sweet potato and only for the adults, always with moderation and if we don’t need to get around, a little glass of muscatel. The history of this tradition is a bit unsure, but the popularity of these delicious types of food assures its future. With all the energy that this food will provide you, the best you can do is take your bicycle and visit some of the activities which will be celebrated around the city during this week. Activities intended, especially, for the children and the family.